If you need to save money now, there are several steps you can take today to grow your savings account quickly. Many people are unable to handle a $400 emergency, leaving them prone to accruing debt. That’s why you should care about growing your savings account now. I believe everyone needs at least $1,000 in an emergency fund to cover unexpected expenses. This money can be used for surprise car or home repairs, emergency medical issues, or anything else not routine. These types of events seem to pop up regularly in my life, so I often have to replenish our savings quickly, because debt is not an option for us. The weekend is coming and the seasons are changing all over the country. This means that people will need help with all sorts of tasks like yard work, house painting, and more. If that’s not your jam, post on Facebook that you’re available to babysit if any of your friends or family members need a kid-free date night. If you’re looking for how to save money fast on a low income, starting a side hustle is your best option. Deliver meals with UberEats. If you’re at least 19 years old, have a government-issued ID (or valid driver’s license for car), have access to a car, bike, or scooter, and pass a background check you can set your own schedule. Make money grocery shopping with Ibotta. Ibotta offers rebates to hundreds of stores, including most grocery stores, and they give out random bonuses for using their app, letting you save money each time you shop. They also pay a $10 bonus when you sign up to use their service. Drive for Lyft. The ridesharing industry is a great way to make extra money to grow your savings account. If you’re at least 21 years old, have a valid driver’s license, have a newer car, and can pass a background check you can drive for Lyft. They’re currently offering a $1,000 earnings guarantee in your first 30 days. You just need 125 rides in the first 30 days to reach the guarantee. Whatever your skills are, there are ways to earn extra income to pad your savings. Find something you can do and get started making extra money. Last year, I got a big tax bill that depleted my savings. It made me nervous so I headed down to my basement to find a big ticket item to sell. But guess what? While going through a big box, I found an envelope with $231 in it! It was hilarious (and awesome) because I found it in the cash envelopes I used to use to budget with (I currently budget using an online budgeting system called YNAB). Plus, the envelope the money was in was labeled “Oops.” It was perfect for a moment like that. Keep in mind that I rarely, if ever, have cash on me. I use my debit card for everything so I was not expecting to find cash in my basement. So, look in the couch cushions, search your pockets, and look in your purses and bags. You never know what you could find! If you want to grow your savings account quickly, try cutting an expense. Doing this means you instantly keep more of your money as you won’t be spending it. If you don’t like calling companies to negotiate prices, try Trim to do the work for you. Trim is a free service that cancels subscriptions you don’t use and negotiates lower prices on services you do use. 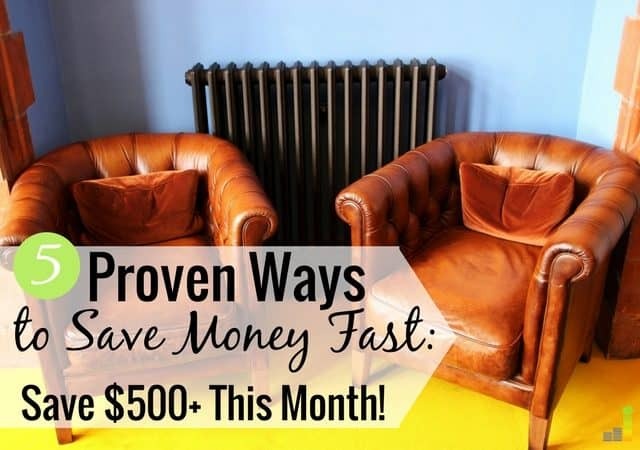 There are many ways to save money every month. Determine what you can live without and use the unspent money to build up your savings fast. The most overlooked way to build up your savings account is by simply putting money in the account. Quite often the simplest solution to a difficult problem is best and that’s the case here. It’s easy to forget to put money in your savings account. Automating your savings solves the problem. Many banks allow you to automate savings on any time frame you’d like: weekly, bi-weekly, monthly, etc. The idea behind this tactic is to pay yourself first. Instead of giving into temptation to spend money, or remembering to add it to your account, automating your savings lets you save money without any effort – which is the best way to grow your wealth. You can definitely make money selling things around your house but that takes time. You have to photograph each item, list it online, coordinate with people who are interested in buying it, and more. However, if you sell a big ticket item, you can make money fast. Some examples of a big ticket item include a piece of furniture, a phone, a computer, or a household appliance – (make sure to use Gazelle if it’s a phone or computer to get top dollar). My biggest piece of advice is to sell your big ticket item at a greatly reduced priced to make sure you can earn money quickly. So, if you never use your $300 KitchenAid mixer and you want to sell it, sell it for $60. You can also look at how much others are charging for the same or similar item and set your price lower. Much like a garage sale, the objective is not to get the most money possible for an item but rather to sell it as quickly as possible to use the funds to grow your savings account quickly. Remember, the faster you build up your savings account, the more protected you are against life’s unexpected events. Ultimately, it shouldn’t take long for you to create or grow your savings account. All you have to do is follow the steps we discussed. Within a few days, you could be sitting on $1,000 (or more!) simply by taking the time to sell a big ticket item or cutting out a few unnecessary expenses. 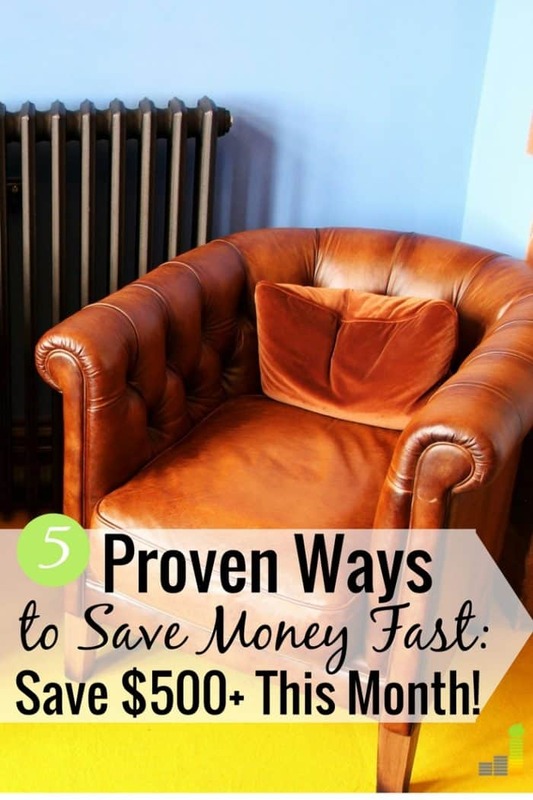 What are some of your go-to ways to save money fast? What do you think is the best way to grow your savings account quickly? What’s one thing you won’t do to save money? Great post, Cat! I am a huge proponent of selling household items. I’m always amazed at what people will pay for things I no longer want or need. I’ve seen a lot of people drive for Lyft or Uber nowadays as a side job. It’s pretty good, and they can work whenever they want to.